When an order is processed through Open Dining, it can be automatically sent to your Point-of-Sale (POS) system and printed on configured ticket printers. 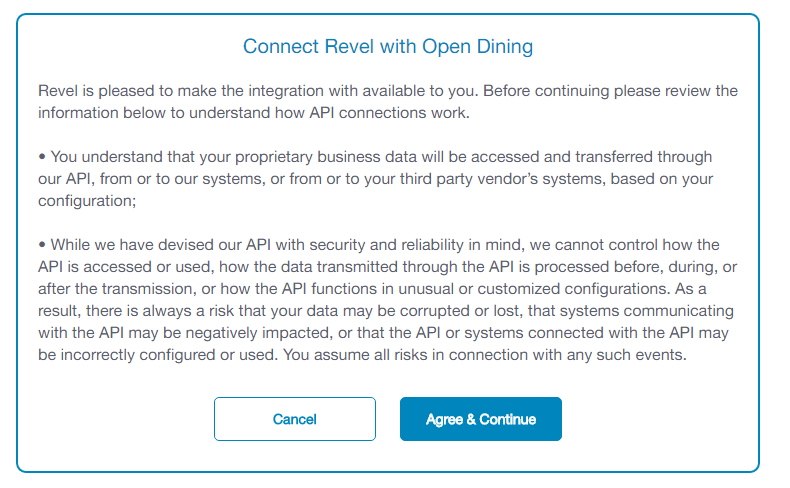 Your POS system must be connected to the Internet to receive orders from Open Dining. Next you'll see a series of checkboxes (Print Order Type Note, Print Delivery Info Note, etc).These options denote extra information that will display on your ticket when it prints. Select all desired options, keeping in mind that they can be changed later if there is too much or too little information on your print-out. Using the automatic Revel sync. Manually creating your menu and mapping the items. In most cases, restaurants use the automatic sync and then make manual updates to the menu to configure it to their liking. After you have followed the steps to connect your EatApp account to your Revel POS, a button will appear on the Receiving Your Orders page. In the midst of your Revel account information, you will see this Fetch Menu from Revel button. Simply click on this button and your menu will automatically import. It is usually pretty instant, but it may take up to 5 minutes for everything to show up on your Menu page. It is a good idea to first click the "Auto-Map POS Items" button. The system will try to automatically match menu items to POS values. You will want to double check the auto-mapped items and make sure they are correct. Occasionally the auto-map function maps items incorrectly. Next you will want to go through and map any items that couldn't be auto-mapped (any item displaying "Select an item" in the drop-down menu). Simply use the drop-down menu and find the item in the drop-down menu that corresponds with the menu item (the item denoted above in bold). Repeat for each category (at the top, there is a "Change Category" option with drop-down menu).